Talbot Rice Gallery is pleased to present an exciting suite of off-site artworks during the first half of this year. As the gallery is temporarily closed for refurbishments, we are branching out of our usual setting and have invited a selection of artists to create works across the University campus. These artists have chosen a public site to explore their own practice and engage with students, staff and public alike. Some works will be discreet and surprising, some will have a direct dialogue with their location and the people that use it on a daily basis. The gallery will produce a guide to orientate visitors around the campus and discover works as diverse as wall painting, sculpture and photography. The projects can be viewed from Monday to Friday during normal University building opening hours (9am  5pm), and an Information Hub will be located in the foyer area of Talbot Rice Gallery in Old College Quad, where visitors can pick up an orientation guide and discover more about the artists' participating in the project. 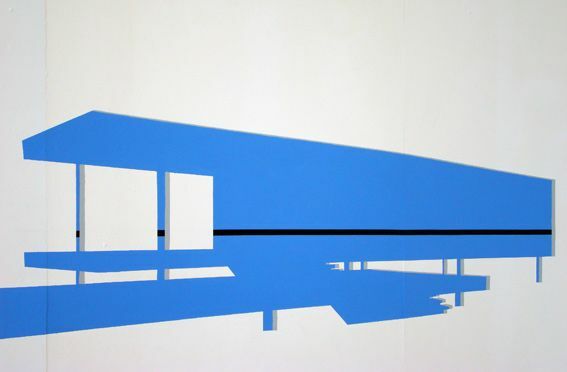 The Artists: Miranda Blennerhassett draws on her interest in a modernist architectural environment to create minimal yet intimate wall paintings that align themselves with the overlooked architectural detail of their surroundings. Blennerhassett has responded to George Square Lecture theatre, a unique RMJM structure completed in 1966, where the artist has painteddirectly onto passageway walls. Alec Finlay is an artist, poet and publisher who creates works that often draw on nature and the environment. As part of a country-wide project entitled Home to a king, Finlay has installed a series of bird boxes which can be discovered by visitors in George Square gardens. Each box displays a play on words which alludes to varying issues linked to research and study, and which also contain a hidden clue as to the species of tree they adorn Oliver Godow employs the photographic medium to observe subtle but powerful visual juxtapositions, often within environments in a state of flux. He is interested in observing the everyday, through a unique sense of composition and colour. For Desire Lines, Godow has created a photographic portrait of life in the University, visiting various departments and capturing traces of occupancy and daily life. Godow invites us to look at and question our surroundings and their use. Iain Kettles creates fantastical, outlandish and playful sculptures that often take the form of inflatables. Kettles places work in public places, and often without annoucement, giving his work a subversive edge. For Desire Lines, Kettles will install in Potterrow Student Centre, a series of inflatable âmasks' that humorously represent various âtribes' within the University student population. Ellen Munro has responded to the vibrant student union setting of Potterrow to create an installation that draws on diverse decorative inspirations. From Egyptological artefacts to the eighties obsession with the generic ethnic print, Munro extracts the visual elements of each to adorn a collection of ready-made terracotta pots. Playing with pots past and present including Attic vases and plastic 'Palladian' planters, the artwork questions the cultural commodification of these past histories.